“I just sat there and waited and waited,” stated Jackson Pierce. “I knew that he would be back down stairs at 1:40.” Pierce had crossed paths with Ayden Nichols only twently minutes earlier with the intention of executing his first major scheme of the game. He had done his research and knew that Nichols would be entering the Rec for a meeting with Coach Patton. Unbeknownst to Nichols, when the time came, Pierce was ready. This was his moment to take him out, but as soon as he was about to put his plan into full action, another student entered the building behind his target. Pierce quickly made conversation as Nichols skeptically asked him what he was doing. Pierce responded by reassuring him that his business there involved the elimination of someone else. Twenty minutes later, Nichols returns to the lobby passing Pierce and ironically wishes him good luck as he continued to the recreational gym. “I dropped my bag and grabbed my gun,” explained Pierce. Nichols had exited the building on the east end of the gym. Pierce then darts for the gym. “I inch flat against the wall and sneak to the far end of the gym,” he continued. He waited behind the doors knowing that Nichols would return shortly. Moments later Pierce made his first successful assassination. On October 16th, thirty-four students on the Greenville University campus kicked off a game that involves hiding from and the hunting of other students under a specific set of rules. The game is called Assassin. 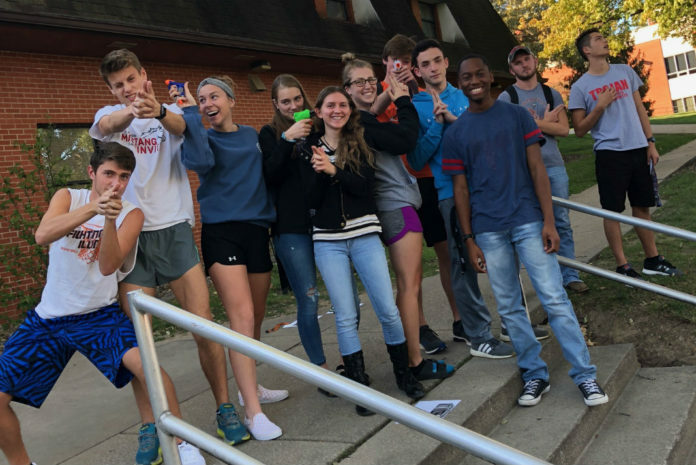 The majority of the participants are members of the cross country team and this round of Assassin was inspired by the spring of 2017, which was the last time the team played this particular game on campus. The rules involve the random assortment of competitors so that each player has a target to hunt down while also managing the target on their own back. 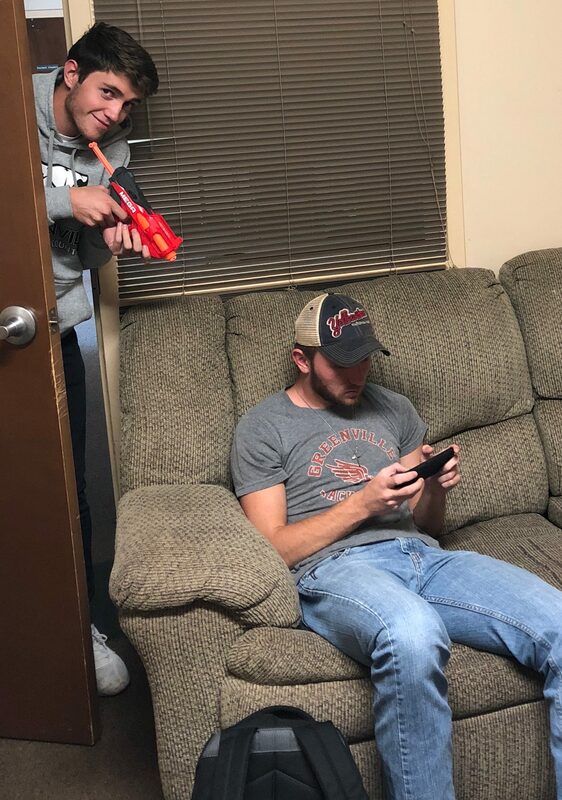 Each adversary is putting every ounce into strategically eliminating their target by popping them with a nerf or dart gun of some sort, but the difficulty of the mission is elevated because each assassination must be made with the absence of any spectators. When a player is knocked out without a bystander, they then pass on the name of the target they were pursuing, and the assassin who successfully made the elimination acquires a new target to aim for. The eventual objective is for an assassin to make his or her trip all the way around the circle and ultimately take out the entire circuit of competitors. Lukas Baird looks to take out Jackson Pierce. The rules were tweaked this go-around and each participant received a partner to strategize with. The game began with sixteen randomly generated teams of two and the only bystander for an assassination could be a player’s teammate. A pair cannot move on to the next targeted pair until both members of the team in front of them is taken out. It was a wild start with six competitors removed within the first day, and two of those individuals knocked out within the first thirty minutes. Today, twelve of the initial thirty-four participants remain. Some have played defense while some have pulled off some insane game changers. High ranked players have been shut down by underdogs. A few have developed reputations as the assassin to watch out for. Alyssa Comer has played a shifty game that has currently deemed her as the competitor with the most eliminations. One of her fatalities humorously mentioned that he was trying to be nice by holding the door open at which time she stopped and acted like she was fixing her gun. He then said to her, “I swear if you shoot me…” As soon as the words left his mouth, she shot. When asked, many players confirmed that this game keeps them on their toes, and someone even said that they had never experienced anxiety like this before. This pastime serves as a bonding experience for cross country team members and for students who caught word of this extreme game. As the days continue and the typical student walks calmly to class and sleeps soundly, those playing the game tread quietly and sleep with one eye open. Excellent article — interesting and well written.